HOLY OMG. This was an addition to my skincare routine this fall, and I am now beginning to see the results of it this winter. Micro-needling, if you haven’t heard of it, is a way to get your body to jumpstart its production of new collagen through micro-injury sites (needle pricks). If you’re like, WTF that’s scary: think of it as a grass aerator for your face. It makes your skincare routine even more effective, allowing it to seep deeper than it normally would! I go heavy on the creams during the cooler months. I go especially HAM on my evening winter skincare routine, as it’s the most important time to focus on skin hydration and regeneration. If you’re looking to up your game when it comes to night products, this cream needs to be on your radar. Pricy? Yeah. Worth it? Absolutely. I am seeing massive improvements in fine lines (I actually forgot I was very overdue for Botox because of it: true story). Don’t take just my word for it: SEE the results live on QVC. Whether you have dry or oily skin, applying oil is so important to keep your skin looking its best during colder months. 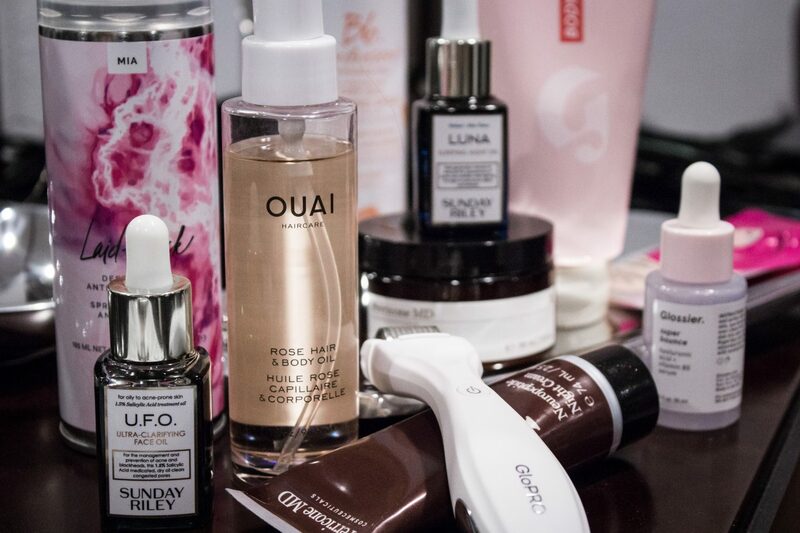 I’m currently prepping for Fashion Week, and am ramping up my anti-breakout skincare, which includes Sunday Riley’s U.F.O. Oil. You’ve likely heard me talk about my obsession with their Luna Sleeping Oil (I wore it during my flight to NYFW last season as a part of my in-flight mini spa session), and I am now hooked on U.F.O. for hormonal breakouts. Results: I sleep with it on, and apply it to my face during the day (lighter), and saw my breakouts disappear in 2 days time. If you’re not sleeping in oil already, you need it be. It helps reduce wrinkles and prevent them down the road. I’ll say it again: oil, oil, OIL. I suffer from extremely sensitive skin on my legs, making shaving during the colder months absolutely unbearable. Anyone else out there with that struggle too? There’s nothing worse than taking a shower in a freezing old apartment in the city and having to shave when you have killer goosebumps. Glossier’s Body Hero Duo has been a complete rescue from razor burn, and I’ve officially tossed every other brand of body wash and lotion. My skin literally feels like a baby’s bottom, and my razor burn is officially a thing of the past. Who hates flyaways and bad hair days in the winter? I’m talking about “beanie(bed)head” and static from puffer jackets. This purchase was a complete luck of the draw random swipe: I was running to my photoshoot in the city last weekend, and the wind was awful. My hair looked horrible, so I swung by Sephora and grabbed a bottle of this stuff. Think of this as Static Guard for your hair. It completely tamed my flyaways. I plan to take this with me to NYFW next week and use it on my tights and dresses too to see how it holds up as a versatile product for travel. I’ve been adding an oil to my ends after I shower to help combat split ends on my bleached tips during the winter months. I’ve been using this since my trip to Moab over Thanksgiving, and have seen a drastic drop in the number of split ends, and overall health of my hair. DOUBLE DUTY product alert!!! When I travel, this has been a viable replacement for my Glossier Body Hero Duo, saving space in my luggage. Who doesn’t love a product that saves you money and space? This was a gift from bumble & Bumble last year. I was in love with this particular line’s shampoo/conditioner set, as well as the pre-shampoo mask, but this stuff is revolutionary! I LOVE this for days when my ends are looking especially dry or weeks where I go several days without washing my hair, and my ends look awful. It’s a quick fix for straw-like hair. If you’re more oily like me, spray it on your hand first, then apply to your hair. I could certainly add some of these winter skincare items to my bag. My skin has been suffering from dryness. I have to try that oil! I can’t wait to try some of these! The Glossier product looks amazing. All sound so good! Need to try some for winter! These products sound absolutely divine. I love skincare products and am always on the lookout for more. I’ll definitely have to try these out! I need to try and some of the oils you mentioned! My hair hasn’t been liking the dry winter so far! Okay. I need to try that B&B I love their stuff! Haven’t tried any of these! Thinking I need to update my beauty routine! 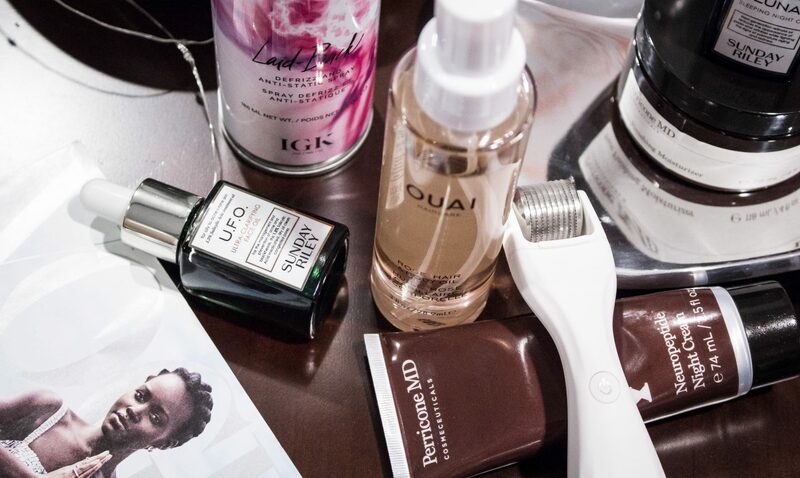 I’m totally going to try the OUAI rose oil for my hair because my lighter locks have been so dry this winter!